Tramore's Robin Dawson will have the chance to become the first player to complete the Irish Amateur Open-Amateur Championship double for 117 years when he tees it up in Saturday's 36-hole final at Royal Aberdeen. The elegant Tramore star (22) beat pal John Murphy from Kinsale 2&1 in the quarter-finals, then saw off another compatriot, Portmarnock's Conor Purcell, winning 3&2 to set up a clash with South Africa's Jovan Rebula. Harold Hilton, the great English amateur who captured The Open in 1892 and 1897, completed the famous double in 1900 (at Newcastle and St George's) before doing it again in 1901 (at Dollymount and St Andrews). Dawson will not be thinking of that, though the stakes are high with places in The Open, the Masters and the US Open on the line. But like Rebula, he has shown he is in a class apart so far this week and the 36-hole final should identify a worthy champion. Rebula, who is a nephew of four-time major winner Ernie Els (his mother is Els' sister, Carina) was never behind in the semi-final as he eliminated England’s Mitch Waite with a convincing 6&4 victory. "Obviously getting messages like that from a guy that has achieved way more than this is really special. We have a really tight bond and a really good relationship. "Wherever he plays, I send him a text message, and when I’m playing he does the same, so we’re always communicating with each other and wishing each other the best." The 20-year-old is the first South African to reach the final since Zander Lombard, who lost to Bradley Neil at Royal Portrush in 2014. As for Dawson, he's trying to give Irish golf a tenth success in the Amateur and follow in the footsteps of Jimmy Bruen (1946), Max McCready (1949), Carr (1953, 1958, 1960), Garth McGimpsey (1985), Michael Hoey (2001), Brian McElhinney (2005) and Alan Dunbar (2012). “It feels good," said Dawson, a former Irish Boys and World Universities champion and a member of the GUI National Panel which is supported by Sport Ireland and Sport NI. "I’m somewhat relieved to make it this far, and I’m looking forward to tomorrow. I’m a bit tired now so it’ll be good to get a good sleep tonight and get set for tomorrow. "Today was great, but it wasn’t easy (playing against fellow countrymen). They are both good friends of mine from being in Ireland teams in the past, but we had a couple of good friendly matches out there today. It was nice." In the morning quarter-finals, Rebula saw off the challenge of England’s Tom Sloman 2&1, and Dawson booked his semi-final berth coming through another all-Irish tie with recently crowned St Andrews Links Trophy champion John Murphy from Kinsale, also 2&1. Dawson claimed the first hole against South Carolina based Purcell, the 2016 South of Ireland champion, and never looked back as the Dubliner failed to recapture the form that saw him defeat world No 19 David Micheluzzi from Australia in the morning. 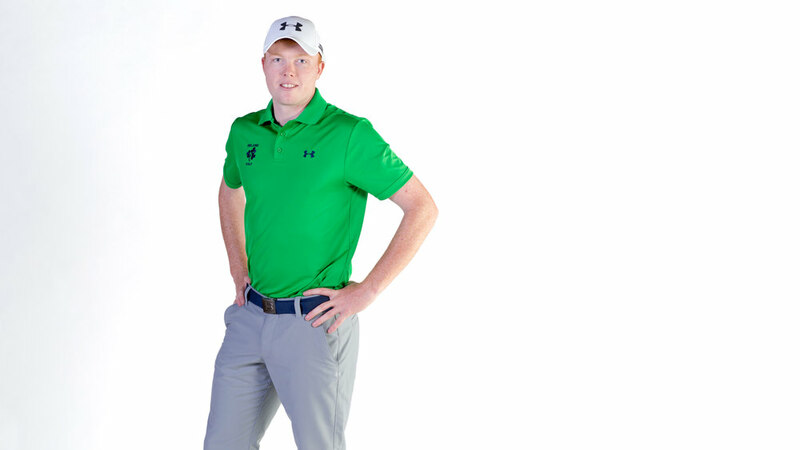 The Tramore man won the Flogas Irish Open Amateur Championship at Royal County Down in May, and he showed maturity and patience to book his spot in the 36-hole final as he compiled a bogey-free card. Despite Purcell’s attempts to impose himself on the match, pulling a hole back at the par-3 8th to cut Dawson’s lead to 2 holes after he went 3up at the 6th, Dawson’s victory was never in doubt. The GB&I St Andrews Trophy squad member was made to wait however when Purcell produced an excellent birdie at the 14th. But world No 35 Dawson, coached by former Walker Cup player and multiple championship winner Noel Fox, held his resolve and completed his victory over Purcell at the 16th. “He’s (Conor Purcell) had a great week, beat some tough players as well, like David Micheluzzi, who is number 19 in the world," Dawson said. "He’s had a great week so he should be happy with himself. “I had a good strategy in place and was just hitting decent shots. My swing was good and I was in my own little world at times out there, which was great. “I’ve known him (Jovan Rebula) for a couple of years now from going down to play in tournaments in South Africa so it’ll be nice. It should be a good game tomorrow. “To get the chance to play in one major, never mind three, is great. I would love that opportunity, but there is still a lot of golf to play tomorrow." As for Rebula, who plays collegiate golf for Auburn, he took the lead at the second and was five up at the turn against Waite, who pulled one hole back with a birdie at the 11th but quickly went five down again when the South African birdied the par-5 12th. The 192nd world ranked golfer closed out the match at the 14th in clinical style with the perfect approach shot to secure victory and progress through to the final, where he will attempt to become the first South African to lift the historic trophy since Bobby Cole at Carnoustie in 1966. “It’s a bit of mixed emotions as everything happened so quickly this morning. This is all what we play for, this is all what we’ve been preparing for for months. "I’ve been working hard towards this so being able to reach the final is such a big thing and hopefully I can take it a step further tomorrow. “Mitch didn’t have one of the greatest days out there today, but in all honesty, I’ve been playing really good golf, hitting the ball so solid through the wind today, putted really well and didn’t make any mistakes. “On Mitch’s side he made a couple of more mistakes than I did, but my game was really solid, and I kept the ball in play all day. I took advantage on the holes you need to attack, played it clever out there, and I’ve got a good feel of this golf course at this stage. I’m honestly having so much fun out there." The 123rd Amateur Championship final is set. South Africas’s @JovanRebula faces Ireland’s @dawson_robin on Saturday. Staying in the present is key, and both men know that there's no point thinking about the rewards at stake just yet. “I’ve honestly not even had the time to think about that (The Open), and I’ve just been taking it as it comes, I’m not even looking at my opponents beforehand I just take it easy and spend time with my mates," Rebula said. "They’ve been a great support structure also, they keep me motivated, and it’s awesome having one of my good friends (Matt Saulez) on the bag too. It’s always pleasant. “The Open is the biggest tournament in the world, and we all admire that tournament so much, we’re always tuned in for it. To us, The Open is definitely a bigger deal." The 36-hole final gets underway tomorrow at Royal Aberdeen at 8.30am. For scoring and updates visit www.Randa.org.